Imagine you could start each and every day with an excursion into paradise. AquaSymphony by GROHE lets you escape for a moment and step into another world: a world where the interplay of water exhilarates and renews you, bathing you in softly coloured light and soothing you with relaxing sounds. Become part of a composition that inspires all the senses – the symphony of showering. AquaSymphony is not a shower – it’s a wellness zone, a place where water takes on a life of its own. AquaSymphony plays with water, creating ever-changing liquid harmonies. Just imagine the pleasure that awaits you. With AquaSymphony you can create your perfect shower moment. The intelligent control system lets you select and adjust a different shower experience for every day, to be completely in tune with your wishes. This is the Rain Spray. Close your eyes. Gentle warm summer rain descends in soft droplets. Can you feel it? How it cleanses your mind as it cleanses your body, creating a moment of meditation. The new enhanced Rain Spray delivers larger and softer droplets for a luxurious shower feel. Escape behind the AquaCurtain, a fragile veil of pure water that envelops you, drawing you into a dreamlike dimension. A fascinating play of water that surrounds you with a delicate beaded curtain of water droplets. Let this opulent cascade of water pour over you, washing away the day and leaving you refreshed and exhilarated. An extra-wide water outlet recreates the exhilarating impression of a waterfall. Like a fresh sea breeze, the Drizzle Spray breathes new life into you. The cool fine mist wafts gently over your skin, enlivening and rejuvenating you. The name alone says it all. A soft stream of pure water that falls straight from the centre of the showerhead – like a fresh mountain spring. Slough off the day. Ease your muscles. Lean back and let the pulsating Bokoma Sprays get to work – treating you to the tension-relieving sensation of a fingertip massage. One ingenious App to conduct a perfect ensemble. 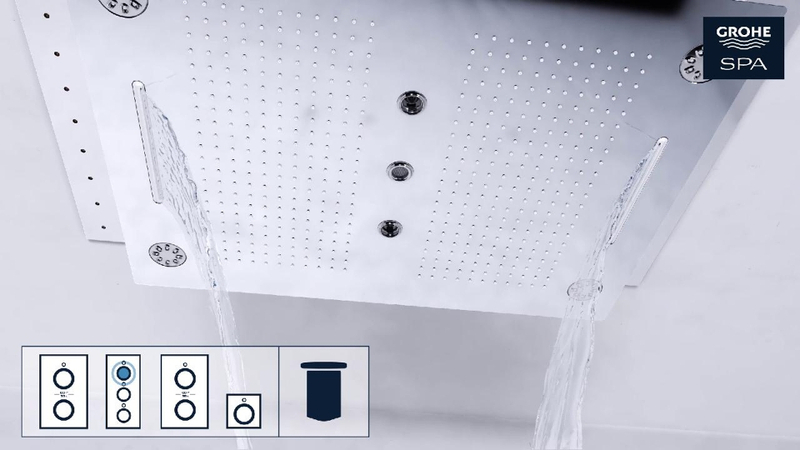 The F-digital Deluxe base unit box and an Apple or Android mobile device installed with the GROHE SPA App, allow for perfect control of light, sound and steam – as well as individual modules. Let the performance begin. What mood are you in? A blue mood? Or more of a rainbow coloured one? Our light curtain surrounds you with an array of colour, creating a backdrop that inspires your senses and enhances your feeling of well-being with soothing chromatic effects to match your mood. Let the sounds of your favourite music mingle with the music of splashing water. Whether you prefer cool jazz or the uplifting sounds of a symphony – you can enjoy an individual concert of your choosing. Gentle steam, long known for its many positive effects, is now available in your shower. It opens the pores, detoxifies the body and hydrates the skin. Aromatic oils enhance the steam for a relaxing and extra luxurious pleasure. Make your shower experience perfectly complete by surrounding yourself with a curtain of colour. A myriad of different colours let you create a personalised light show to delight and relax you while you shower.